With an almost magical and vintage flair, this antiqued sterling silver unicorn charm pendant from Apples of Gold Jewelry combines the favorite look of sterling silver and the sweetness of a unicorn to make a beautiful piece of jewelry! This .925 sterling silver unicorn has an antiqued look - some areas are darker than others, making it look well loved. The approximate size of this pendant is 13/16", and it weighs approximately 2.2 grams. When paired with a favorite chain, this lovely pendant will be a favorite for many years to come! 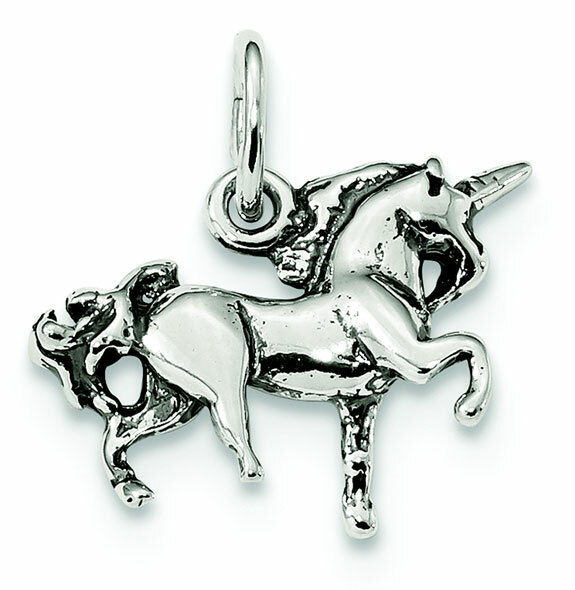 We guarantee our Antiqued Sterling Silver Unicorn Charm Pendant to be high quality, authentic jewelry, as described above.